If you ran on the beach for an hour, would you run in the deep soft sand or the wetter sand closer to the water? Most of us would choose the wetter sand that provides a stable surface while still offering some ‘give’. Running in soft deep sand doesn’t give a stable landing, and the sand particles move as we land on them, making the surface even less stable. It’s likely to hurt your knees, ankles and hips if you keep going in that footing. The joints in the horse’s legs are not designed for ongoing work in deep loose footing any more than ours area. When the horse lands in deep loose sand, one side of a foot will land first, sending a concussive force up the limb into the bone and cartilage. The other side will land ‘late’, and this creates a jerking effect on the ligaments and tendons. Over time, this will predispose the horse to ringbone, an arthritic condition that can have dire outcomes. 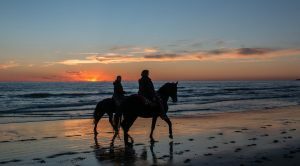 Even a short ride in deep sand footing can cause back strain in your horse, in the same way that your back muscles are likely to ache if you run in deep sand for more than a few minutes. Soft pasture is ideal footing, and for most horses kept for recreational purposes, it’s where they live. If you ride in an arena regularly, look carefully at the depth of the footing. If the surface is dry sand more than a couple of inches deep, look to make changes. Are you overlooking the muscles? Most musculoskeletal problems start with the muscles. This is because the muscles are designed to take some of the concussive force of movement, and if they are in a hypertonic state (too much tension), more of the load is transferred to tendons and ligaments. If the elastic strength of ligaments and tendons is exceeded, these structures will be strained or torn. Bones, ligaments and tendons can only do what the muscles allow them to do. Muscles contract, making them shorter from end to end, and this causes movement. Muscles keep the right amount of tension on vertebra via tendon attachments. If the muscles are too tense, the vertebral segments lose range of motion and become “fixed”. Acupuncture releases tension in muscles and resolves muscular pain. Using acupuncture to release the muscular tension before doing spinal manipulation assists the vertebrae to retain the increased range of motion. If spinal manipulation is done without addressing restrictions in the myofascial system, the shortness of the muscles is likely to cause the vertebrae to again lose range of motion. The torque and strain patterns of the muscles and fascia (soft connective tissue) place asymmetric forces on the skeleton, resulting in further injury. Keep excessive tension out of your horse’s muscles, and he /she will be much less prone to all musculoskeletal injuries. Prevention is always preferable to cure, and will keep you in the saddle more. Call Naomi from Equinox to help: 0488 118155. You may be alert to behavioural changes in your horse that can indicate back pain, but do you get in early to prevent back pain? Horses’ backs are not designed to carry riders, so it’s up to us to do all that we can to reduce the impact of them being ridden. 1. Be careful with any changes to terrain or footing, and with increases in physical demands. Riders often consider slowly rebuilding a horse’s cardiovascular condition after a break, but the back also needs to be cared for. An abrupt change to the level of work puts more pressure on the structures within the horse’s back, which can result in injuries and pain. Start slowly, and only gradually increase your horse’s workload. Think about your intended purpose for your horse, and what level of fitness is appropriate for that purpose. Watch your horse for signs of discomfort. 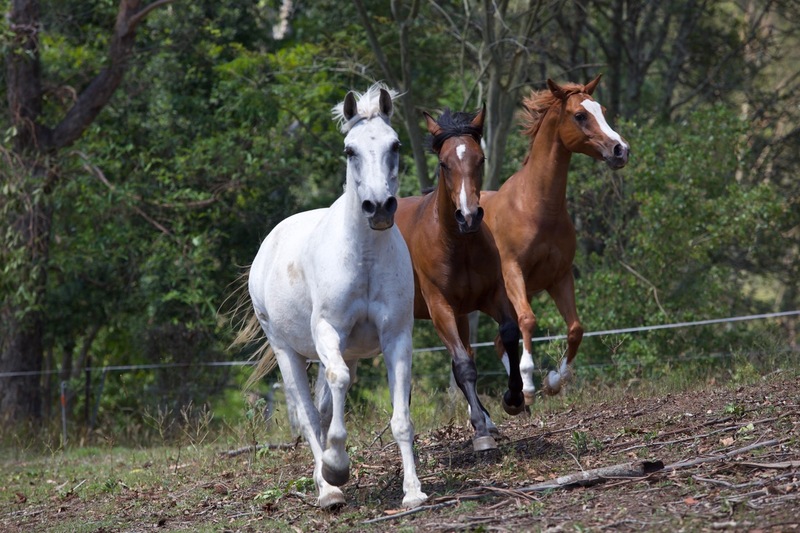 Even if your horse is already fit, changes to terrain or footing can result in back strain. If you normally ride on firm footing and once a month head off to an arena with deep sand for a workout, this can cause back pain. Cold muscles are much less elastic and therefore prone to injury. Make sure you do a slow and gentle warm-up before asking your horse to increase speed or perform more demanding movements. An effective warm-up can be done at walk, and will help the horse by increasing blood flow to the muscles, stretching muscles, ligaments and tendons, and warming the muscles. By incorporating different sized figures and lateral work, and thoughtfully transitioning to and from walk to halt and slow backup, you can benefit the whole horse, physically and mentally. Modify your cool-down routine based on how strenuous the ride was. Consider your horse’s temperature and respiration rate. As with the warm-up, concentrate on walking for your cool down. Chinese medicine recognises that an individual’s physical constitution can predispose them to pain or injury in certain areas of the body. This constitution can therefore be a cause underlying the symptoms. A regular ********* acupuncture treatment can thus help to prevent back pain. In addition to acupuncture, you can help to prevent muscular injuries by giving your horse acupressure, which you can learn at one of my ********acupressure clinics. People sometimes talk about ‘building’ their horse’s ‘top line’ by strengthening the muscles of the back. However, the muscles that provide the most support to the back and help build the strength to carry a rider without damage are found below the vertebral chain. We should not be doing anything that causes the muscles above the vertebral chain to contract, as these muscles need to be in a relative state of release when a ridden horse is moving well. One thing that can cause contraction of the back muscles is mouth pain, as it tends to cause an elevated head and hollow back. Moving in this posture increases tension across the entire spinal column. Make sure your horse’s bit or teeth are not causing pain. – Backing up one step at a time (one step, halt, one step, halt). There is no need to do a lot of steps all at once. Start with just one step back and build up to a few. Make sure each step is done freely and loosely before asking for the next, and this will help to engage the core muscles. – Cavaletti. If you’re just starting to build your horse’s core strength, be cautious when starting. Begin by walking the horse over one pole laid on the ground, and gradually build to four poles at a walk with a few passes over the poles in each direction per session. If you support the horse to move consciously rather than just rushing through, this is sufficient to work the core muscles; there is no need to increase the height or frequency for quite some time. – Incorporate hill work into your riding or groundwork, starting with slight inclines and declines, and only gradually increasing. Horses in a state of hyper-excitement are likely to have spasm or excessive tension in their back muscles. Maintaining softness and calmness is, of course, key to good horsemanship, but its direct link to the horse’s back (and the rest of the body) are not always considered. The horse’s back is a complex structure that includes the spinal cord, 24 vertebrae between the top of withers and tail head, muscles and ligaments holding the vertebrae in place, joints between the vertebrae, and muscles that connect the vertebral column to the limbs. With all those components needing to work together, and every movement of one part affecting other parts, protecting the back from injury is one of the most important things we can do to keep our horses sound in the long run. Taking these steps will also help prevent behavioural and performance issues, giving our horses, and us, a better ride. If your horse is experiencing some mental or emotional issues such as fear or nervousness, I may be able to help. Chinese medicine has always recognised unbalanced emotions as a major cause of physical disease and injury, and I use acupuncture to address these underlying issues as well as physical symptoms. Now I’m adding a new service to complement the acupuncture: coaching horses on the ground. For instance, if a horse is having difficulty with the saddling process, we want to help them to move from a state fear and into a state of acceptance and curiousity. When a horse is fearful, they’re in a state of flight or fight, which means they can’t also be in a learning frame of mind. A horse has to be helped to reach a place where they feel at peace on the inside before they can be asked to learn and participate. Curiousity is our ally, since in horses it only arises as fear diminishes. Once a horse is curious, they can start to explore the situation and be guided by the person, who can take on the role of teacher or guide. When you were in school, if you were nervous or scared for any reason, could you concentrate properly and learn new things? How different was it when you were supported and encouraged to try, knowing you were safe to make mistakes and keep seeking answers? Did this make you more curious about exploring and learning? Did it encourage you to just have a go? If a horse feels completely at peace on the inside and connected with the people around them, physical injuries will be far less likely because all the muscles, ligaments, tendons and joints will be working efficiently. Chinese medicine links certain imbalances in emotions to specific body systems. For example, the emotion associated with the Liver organ system is anger / frustration. The Liver organ system also controls tension in the muscles, so if a horse is experiencing frustration in its daily life, the muscles will be in a state of tension more often. Ultimately this leads to injury, as tight muscles are far more prone to injury than muscles in a relatively relaxed state. By combining acupuncture with coaching, I am able to work with the horse’s body and mind through acupuncture and work more directly with the horse’s mind through coaching. Everything is connected: if a horse feels good on the inside, they will be physically healthier and more able to be a safe, fun partner for their person.